Both were arrested in flagrante delicto for international drug trafficking after cameras caught the action. 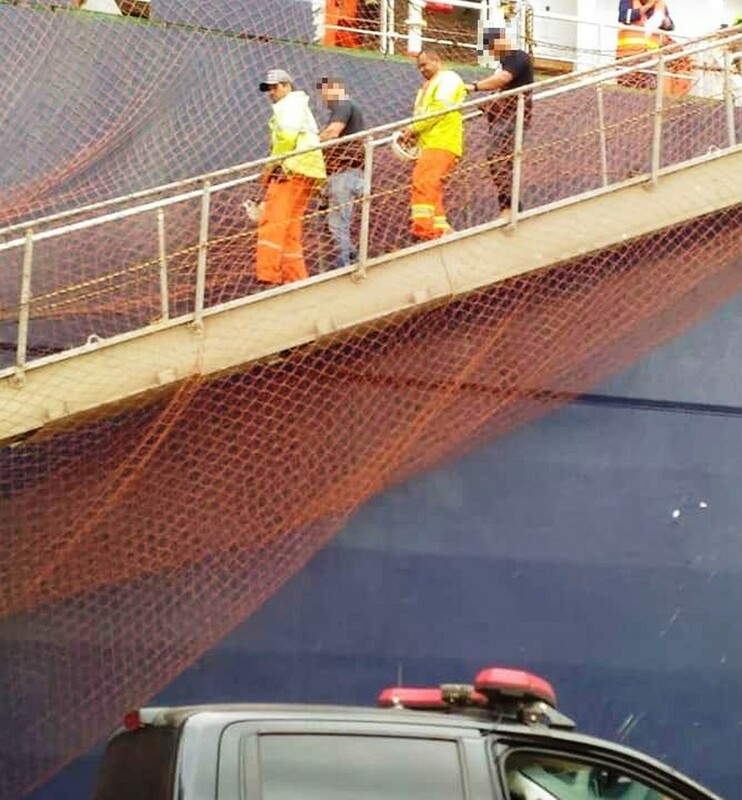 The Federal Justice held on Thursday (7), the stevedores Sérgio Tarcísio de Campos Rodrigues, 40, and Milton Ruiz Horacio, 38, who were caught lifting a shipment of cocaine to a ship docked in the Port of Santos, on the coast of São Paulo. The defense of one of them informed that it will request habeas corpus from the client. The blatant occurred after images of monitoring cameras indicate suspicious movement in the vicinity of the Liberian-flagged ER France vessel, which was docked at a container terminal on the right bank. Onboard the freighter, the pair pulled up a black bag with the drug of a smaller boat. In custody hearing held in Santos, Judge Roberto Lemos do Santos Filho, of the 5th Federal Court, decided to order custody for both. The understanding is that the possible freedom of both, even with precautionary measures or application of bail, could jeopardize public order and investigations. The Federal Police works to identify possible others involved in the criminal action, which was frustrated. In addition to determining the involvement of other port workers, the objective is to identify and locate the people who were aboard the small boat that approached the ship to take the drug that was hoisted. Lawyer João Vitor Fontoura, who defends Sérgio Rodrigues, reported that the client has been a stevedore for more than a decade and that he has a good record. “He said he was working at the time and not connected with the crime,” commented the defender who will enter habeas corpus in higher court to try to free him. The G1 was not able to contact federal public defender Milton Horacio, who did not present a private lawyer to defend him. Both remain imprisoned in Penitentiary I, in São Vicente, where they were taken from the time of the flagrant, which occurred between dawn and Tuesday morning (5). The action took place in a container terminal on the right bank at dawn. The IRS reported that a small vessel was registered by cameras approaching a vessel through the Estuary Channel. From her, a bag of dark color was hoisted to the freighter by ropes thrown into the sea. The federal teams were mobilized and managed to locate in tablets 17.26 kg of the drug neatly next to the door of a container, whose destination was the port of Las Palmas, Spain. The agents identified two dockers, who were aboard the ship, as those responsible for hoisting the bag to the deck of the vessel. The two ports are not tied to the terminal and are scaled by the Manpower Management Body (Ogmo) of the dock. They were sent to the Federal Police Station, in the center of Santos, where they remained in custody, after giving testimony and being proven to participate in the mode of trafficking through expertise of the images. By means of a note, Ogmo lamented what happened and stated that it could open an administrative procedure when requested by the port operator. The Syndicate of the Stevedores, through legal advice, said on that occasion that it did not follow the case and that the dockers were assisted by their own defenses.